We understand that an efficient communication infrastructure is an important, long-term asset to all businesses, and our electricians are communication engineers in delivering electrical networks that produce efficient, reliable communication. Contact us today for more information about serving your communication and data infrastructure. Danco Electrical Contractors, Inc retrofit a 2,000 KW generator in an existing building with an active data center. 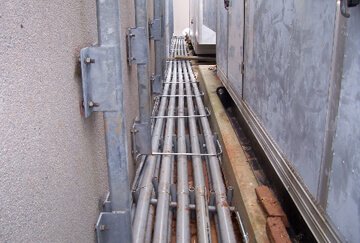 The project required installing 200 linear feet of 300A feeders in a duct bank, 3000A disconnects, and multiple duct runs to complete the power run. The inherent challenge with most data center project is shunting the power to keep servers operational as well as all HVAC and lighting. In this project, isolating the generator sections, while maintaining power for critical business applications, proved to be formidable.